The focus of the Unsignalized Intersection Improvement Guide (UIIG) is the unsignalized intersection, which is defined as any at-grade junction of two or more public roads at which the right-of-way for motorists, bicyclists, and pedestrians is not controlled by a highway traffic signal.1 Unsignalized intersections can be categorized in a variety of ways, such as by type of traffic control, area type (i.e., urban, suburban, rural), and number of approach legs. Because intersection traffic control type defines the scope of the UIIG, it also serves as the basis of the Guide’s classification of unsignalized intersections. Also discussed briefly at the end of this section is an emerging typology applicable to unsignalized intersections—traditional versus nontraditional geometric designs. Intersection traffic control type refers to the most restrictive level of control employed at the intersection, with yield control being more restrictive than no control, and stop control being more restrictive than yield control. 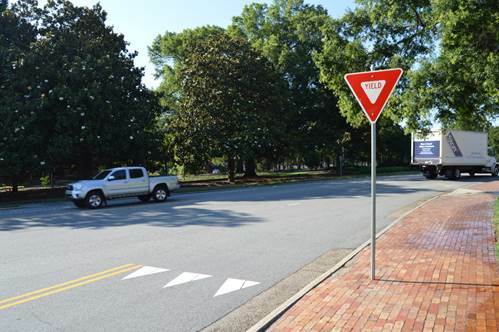 In essence, any and every unsignalized intersection can be classified as being one of the following: (1) uncontrolled, (2) YIELD sign-controlled, or (3) STOP sign-controlled. Each type is described below. An uncontrolled intersection is one in which the entrance into the intersection from any of the approaches is not controlled by a regulatory (i.e., STOP or YIELD) sign or a traffic signal. Per §11-401 of the Uniform Vehicle Code: "when two vehicles approach or enter an intersection from different highways at approximately the same time, the driver of the vehicle on the left shall yield the right-of-way to the vehicle on the right.” The driver must also yield to any vehicle that is already lawfully in the intersection and any pedestrian in a marked or unmarked crosswalk. 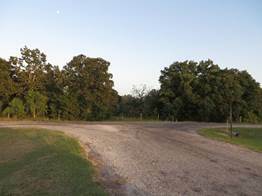 Uncontrolled intersections are usually limited to very low-volume roads in rural or residential areas, as illustrated below. For example, the residential areas surrounding Topeka, Kansas have numerous uncontrolled intersections, such as NE Ohio Ave./NE Sate St. and several adjacent intersections. Two additional examples in Wyoming include Old US Hwy 85/Old US Hwy 85 Connector in Newcastle and Willow Ave./Cliff Dr. in Saratoga. and very low-volume, rural areas (right). Sources: VHB (left) and Kay Fitzpatrick (right). For this type of unsignalized intersection, entrance into the intersection from one or more of the approaches is controlled by a YIELD sign. Under this control, drivers on each approach controlled by a YIELD sign are required to reduce their speed to concede the right-of-way to vehicles and non-motorists in the intersection; therefore, adequate sight distance must be present so the driver approaching the YIELD sign can stop if necessary. YIELD signs are usually placed to control the minor road, and they are often installed at ramp intersections or Y-intersections. Circular intersections—specifically, roundabouts and mini-roundabouts—represent the only intersections at which YIELD signs are installed on all approaches, as vehicles within the circular roadway always have the right-of-way. Examples of YIELD signs being used as intersection control. Source: VHB. Multi-way stop control—at intersections where all approaches are controlled by a STOP sign and an ALL WAY supplemental plaque is used. For this application, the right-of-way is determined by the order in which users reach the intersection; if two vehicles arrive at the intersection at nearly the same time, then the vehicle on the right has the right-of-way. 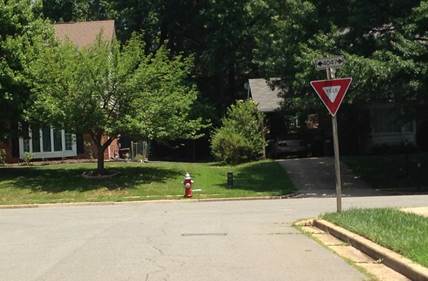 STOP signs at a minor approach of a four-leg intersection (left) and with an ALL WAY supplemental plaque at a multi-way stop-controlled intersection (right). Sources: VHB (left) and Lee Engineering, LLC (right). 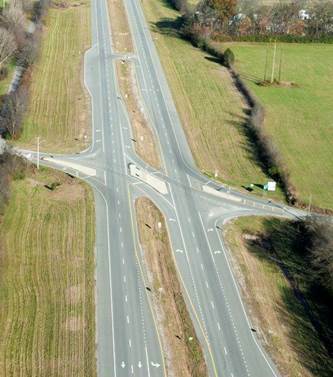 Nontraditional intersections are becoming increasingly popular in many regions of the country. Also known by other names (e.g., alternative, innovative, and unconventional intersections), these designs alter the customary vehicular paths at the intersection in order to reduce the number and/or severity of conflict points there. 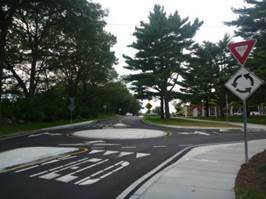 With regard to unsignalized intersections, two basic groups of nontraditional designs include the circular intersection and the U-turn-centered intersection. With each successful public education campaign and installation of a nontraditional design, the collection of resources and supporting materials available to other interested agencies becomes more robust. In light of the increased focus on and occurrence of these intersection types nationwide, it is expected that the application of nontraditional designs will continue to spread. In addition to the information below, several resources are noted in the UIIG’s Other Resources. A circular intersection is a type of at-grade intersection at which vehicles travel counterclockwise around a central island and exit to an intersecting road. This design is intended to compel drivers to decrease their speeds approaching and within the intersection, which in turn will decrease the severity of any crashes that do occur. The three primary types of circular unsignalized intersections are the modern roundabout, mini-roundabout, and residential traffic circle. A modern two-lane roundabout. Source: FHWA. Splitter islands on the approaches that accommodate pedestrian crossings and channelize vehicular movements. At each approach to the roundabout, a YIELD sign (and oftentimes yield line pavement markings) is used to control access into the circulatory road. The mini-roundabout is typically characterized by a smaller inscribed outer diameter than a roundabout (typically 45 – 90 feet), a traversable center island over which trucks, buses, and other heavy vehicles may drive, and (sometimes) a splitter island on one or more of the approaches. Mini-roundabouts are generally used on lower-volume streets and where space is inadequate for a full-size roundabout. Each approach of mini-roundabouts operates under the control of a YIELD sign. Mini-roundabouts function similarly to modern roundabouts but require less right-of-way with a smaller footprint. Sources: FHWA (left) and VHB (right). 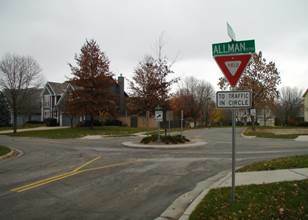 This type of circular intersection is typically used at the intersection of two local residential streets for the purpose of traffic calming or aesthetic appeal. The approaches may be uncontrolled or controlled by a YIELD sign. There is typically an island or central feature that may or may not be traversable. Unless explicitly prohibited, left-turning movements for larger vehicles are allowed to occur in front of the central island. Residential traffic circles can be used on neighborhood streets for traffic calming and aesthetic purposes. 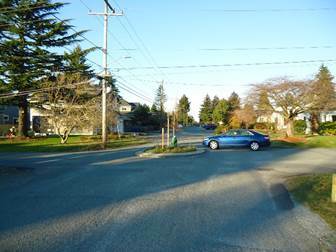 An uncontrolled residential traffic circle in Seattle, WA. Source: Rebecca Fiedler. 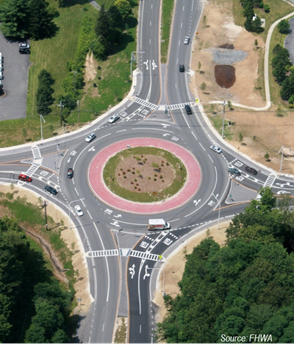 For more information on circular intersections, see NCHRP Report 672 (Roundabouts: An Informational Guide, Second Edition) and the FHWA Office of Safety website. 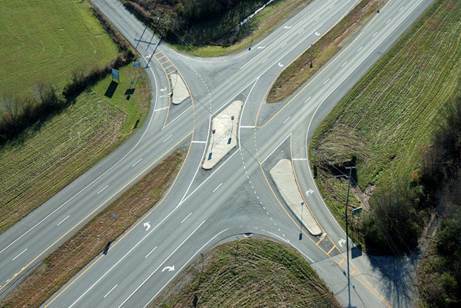 While circular intersections typically accommodate all turning movements at an intersection, other nontraditional designs prohibit certain movements at the junction itself and require them to be completed at some distance from the intersection. In most cases, this comprises the replacement of through and/or left-turn movements from the minor road with a combination of a right-turn and U-turn. Notable U-turn-centered intersection types include the Restricted Crossing U-Turn (RCUT—a.k.a., Superstreet or J-turn), Median U-Turn (MUT—a.k.a., Michigan Left or Indirect Left), and Displaced Left-Turn (DLT—a.k.a., Continuous Flow Intersection [CFI]) intersections. Of the three, only the RCUT design is applicable to an unsignalized intersection. The RCUT incorporates directional left-turn crossovers at the intersection and U-turn crossovers upstream and downstream of the intersection. While the RCUT allows left turns and through movements from the major street, through and left-turn maneuvers from the minor street approaches are prohibited. Minor street drivers desiring to turn left or continue straight must first turn right onto the major street, proceed to the downstream U-turn crossover, and execute a U-turn. 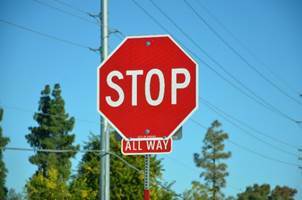 The crossovers and minor street right turns may be placed under the control of a STOP sign or a YIELD sign. Conceptual RCUT configuration for 4-legged intersection. Source: FHWA AIIR. Conceptual RCUT configuration for 3-legged intersection. Source: FHWA AIIR. A variation to the RCUT design can be made by eliminating the direct left turns from the major road. This converts the minor road to a right-in/right-out configuration and requires that all left-turn movements to and from the minor road include a U-turn maneuver. An example of this alternative design is the Lake Michigan Drive (State Route 45) Corridor in Allendale, Michigan, along which the minor road right turns operate under stop control and the major road U-turns operate under yield control. 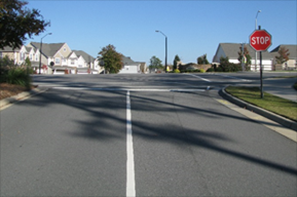 More information on nontraditional intersection designs is available in the FHWA Alternative Intersections and Interchanges Informational Report and on the FHWA Office of Safety website. Directional left-turn crossovers at main intersection and U-turn shown downstream. Close-up of the main intersection at a RCUT. Source: Tennessee DOT. 1. 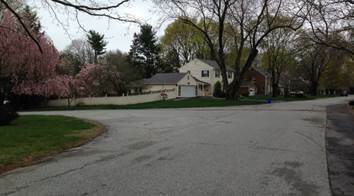 Residential or commercial access driveways are not included as “unsignalized intersections”; however, the existence of driveways close to an intersection is recognized as a potential problem that can be addressed through access control measures.